As stupid as it will sound. 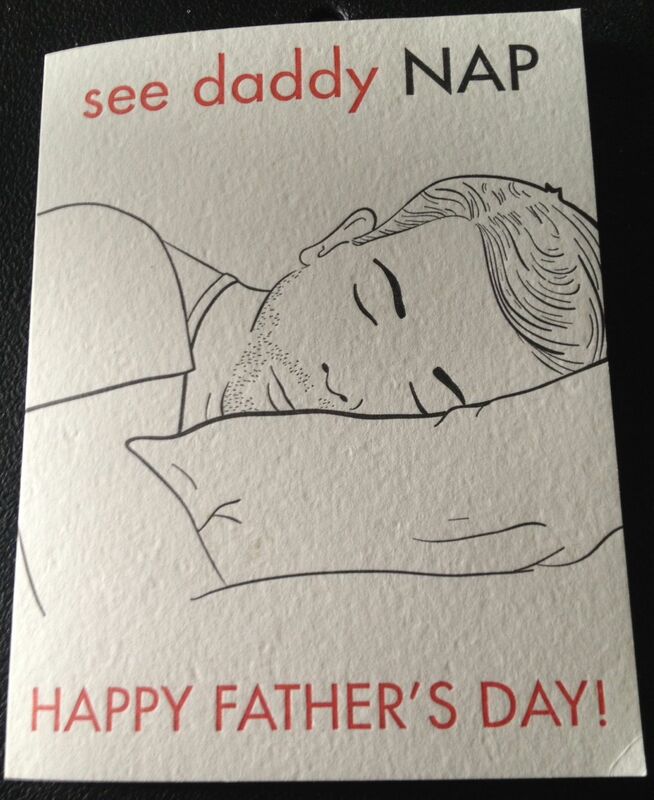 I went out and bought myself a Father’s Day card. What is even dumber? 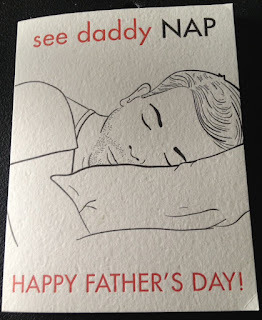 I bought it a month before Father's Day, I guess thinking they may actually have one this year. As you can see, the card could be used 24/7, if you hang it outside whatever room you're in when the nap fairy overtakes you. Hey, it happens! Ok, onward on a lot of random thoughts. Clearly, it is folly to try to dissect the Stanley Cup Finals in between games three and four, so these observations are just that, observations. Here goes: If games one and two (both overtimes, in case you have forgotten) were played at a level 10 on a 1-10 scale, then game three at the Touch Down Bank Garden in Boston was a tepid 7. Blame exhaustion, for the players, fans, and media. There are only so many level 10’s we can take and then, shorten the time between games by a day, there it is, a 7! In no way a criticism but just observation. The Blackhawks tank looks like its running on empty. Perfectly understandable. I actually had the opportunity to talk to a current NHL goaltender last night who doesn’t have a dog in this fight. We talked about goaltender things like shootouts, equipment, Tim Thomas vs Tuukka Rask blah, blah, blah. It was enlightening. On to the Rask/Thomas debate, which has become a sub-plot around here for those who just can't stop picking at a wound. Thomas naysayers, who once claimed he had the greatest run of any athlete in any sport around here, and that he had that single-handedly. carried them to a cup in 2011, are now claiming, that Tuuka is better. At least in this 2013 run. Mr. NHL goaltender (who I am not identifying, sorry) had some thoughts..
One, Rask is much younger than Thomas was at the time of the peak performance. Also, Tuukka's style makes it look a lot easier that it actually is, but the more significant and important point is, this Bruins team is a lot better than the last cup winner. More mature, more experienced, deeper, and besides, most of the puck stoppage is done before Rask gets a touch. That, he points out, was not the case with Tim Thomas two years ago. The point being that each has had his time. This is Tuukka’s time, pardon the phrase. Tim Thomas stands alone. (I guess in more ways than one). NO, this NHL goalie didn’t know where Timmy was at the moment and didn’t even guess as to whether he was watching. On to other things, but no less controversial. The Blackhawks sweaters are at the top of the list for many in the favorite team uniform race. Myself included. So explain to me why Dartmouth had to change its mascot, the Cleveland Indians had to drop Chief Wahoo, the North Dakota Fighting Sioux are being fought over in their legislature, and the Washington Redskins appear next on the list to get the ax? I get it. Clearly, we all should get it, but why does the Chicago Blackhawk Jersey get a free pass? This is a curiosity thing and only that. Then there is Tiger Woods. For me, a performer that makes me sit down and watch him work. Well, I'm getting tired of the act. Tired of the bad energy, the grimaces, the lack of joy when winning isn’t part of the weekend. I am just tired of watching someone having a bad weekend and sucking me into that world. Here is where Phil arrives. Never thought that Mickleson would ever pass Tiger on my favorites list, but I think it happened this last weekend. I'll probably go right back to Tiger when he hits great shots and smiles, or at least looks happy, but for now, no! Perfect time to get back to that nap. 2 great goalies, but I'm with you Bob, Tim Thomas' performance stands alone at the top in my eyes. Thanks for a sane perspective on the Burins/Blackhawks, Tiger Wood, etc. Hey I miss Bob Lobel. He is still more than relevant and offers great perspective on Boston Sports. Bob I try to never miss your blog posts. This one was particularly good. I occasionally watch the local sports reports and have had the chance to see older broadcasts of you interviewing some former Boston athletes... I always say to myself after these moments, "Why can't we get reporters like that?' Thanks Bob.